By offering many years of service, our SERVPRO franchise has already made a lasting impact on our communities and our city to be a name that can be trusted in the restoration industry. Since 2012, our franchise has received an annual award from our company naming us among the Top 100 franchises among 1,750 options throughout the country. We earned this award by providing fast, efficient, and high-quality restoration, remediation, reconstruction, and cleanup work throughout the densely populated service area we oversee. We strive to be there for the homes and businesses that need us, no matter when disaster strikes. We offer recovery options for water damages, fire and smoke damages, mold damages, storm damages, flooding, and trauma/crime scenes. Our franchise and its owner are involved directly with our communities through the BBB, BOMA, and Chambers of Commerce, giving us a unique perspective on the needs of the commercial properties, entertainment venues, and medical facilities throughout the city. We are a Large Loss Recovery team, able to handle widespread damages and reconstruction needs of the largest commercial structures throughout Chicago. We are proud to be an active member of this community. 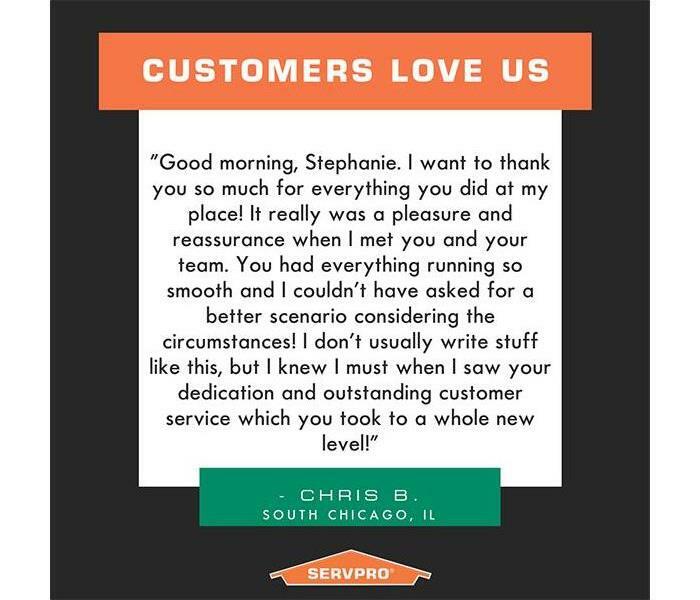 SERVPRO of Evergreen Park / South Chicago City is locally owned and operated, so we’re already nearby and ready to help Chicago, IL residents and business owners with any size cleaning or restoration emergencies.